A distinguished Canadian who helped create the Canadian territory of Nunavut will receive a UBC honorary degree at UBC Okanagan’s Spring Congregation on June 8. The honorary degree, Doctor of Laws (honoris causa), will be awarded to The Hon. Thomas Siddon, P.C., for his distinguished career achievements, as well as service to UBC and to Canada. Dr. Siddon, who holds a Ph.D. in aeronautical noise, turbulence and acoustics, is a professional engineer, author and entrepreneur. He also conducted research and was a professor of mechanical engineering at UBC for 10 years. First elected to Parliament in 1978, Dr. Siddon was a Member of Parliament for 15 years representing the B.C. communities of Richmond and South Delta. He served for nine years as Minister of State for Science and Technology, Minister of Fisheries and Oceans, Minister of Indian Affairs and Northern Development, and Minister of National Defence. 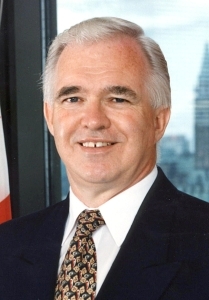 Dr. Siddon’s achievements in public office include establishing the foundation for the Canadian Space Agency and signing the International Space Station Agreement with the United States in 1984, as Minister of State for Science and Technology. As Minister of Indian Affairs and Northern Development, Dr. Siddon negotiated and signed the Nunavut Agreement-in-Principle and later the Nunavut Final Agreement which provided for the creation of that Canadian territory. Born in Drumheller, Alberta, Dr. Siddon now lives in Kaleden, B.C. *This citation was originally released on April 24, 2007 and can be found on UBC’s Okanagan News website. To read each recipient's citation, please visit the UBC Library's Special Collections website.